Youtube has introduced a new global program called “Youtube creators for change” with new resources and grants. It is a new initiative dedicated to amplifying the voices of role models who are tackling difficult social issues with their channels. From combating hate speech, to countering xenophobia and extremism, to simply making the case for greater tolerance and empathy toward others, these creators are helping generate positive social change with their global fan bases. 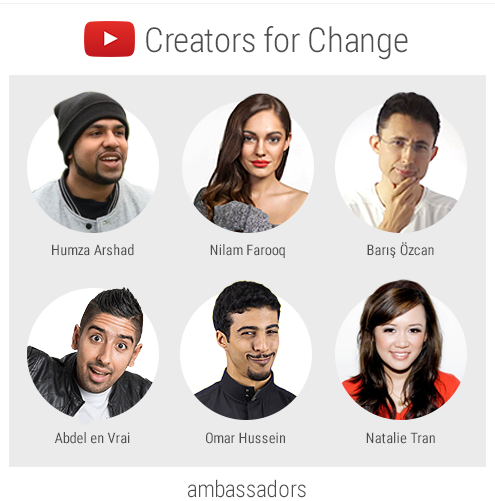 The first six creators for change ambassadors are Natalie Tran from Australia, Abdel en Vrai from Belgium, Nilan Farooq from Germany, Omar Hussein from Saudi Arabia, Baris Ozcan from Turkey, and Humza Arshad from United Kingdom. Other ambassadors will be announced soon. Over the next year, these ambassadors will drive greater awareness of social issues and foster productive dialogue around these topics through the videos they create. They will also help identify and empower emerging creators who also want to speak out on these crucial topics. To support this cause further Youtube announced plans to invest US$1million in equipment and production grants as part of the creators for change program. Youtube will also continue working with NGOs, schools, and media companies around the world to launch more local programs as part of this initiative. As a part of it initiative to generate a positive change, it has also announced that Google.org, the company’s philanthropic arm, is establishing a $2million charitable fund to support non-profits working on innovative solutions that promote inclusion and cross-cultural understanding. The pitch agencies such as incumbent Havas Media, OMD and Zenith Singapore vying for the account. ..
YouTube's decision comes in the wake of a series of regular uploads by Paul, which saw him creating the same sensational content h..